Since online banking has been rapidly growing over these recent years so have people trying to scam you for your hard earned money.Here at GEOARM we want to make you aware of these so you don't get scammed. What these thieves are doing is sending texts that looks as if they are alerts from your bank asking you for your personal information or to reactivate your debit card by following a link on your smartphone. Do not reply to texts asking for personal financial information instead, contact organizations or banking institutions by calling a verified number. 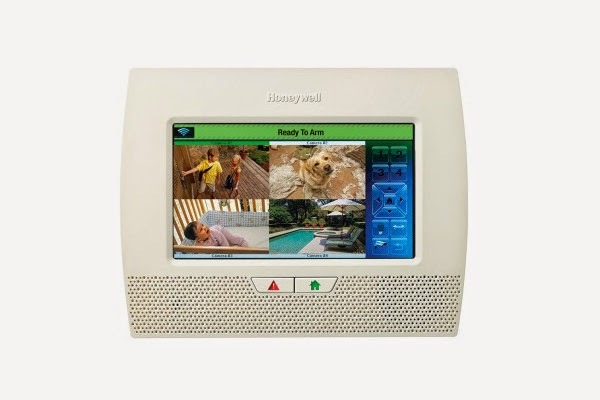 Honeywell has finally released its highly anticipated LYNX Touch L7000 alarm system! Just to emphasize how amazing this system is, The L7000 took best in show at Electronic Security expo this year. In many people’s eyes including GEOARM this could be one of the most superb systems ever created. This system was released shortly after Honeywell's L5200 system. While the L5200 is still an amazing system, there are some key differences in the abilities of these systems. An intriguing feature of the L7000 is the display, it has been stretched to a whopping 7 inch’s that can support up to four cameras to be viewed on the actual keypad, while the L5200 can only support one camera on a 4.7 inch display. The L7000 is a perfect system for those with larger homes or business that require more zones. The L7000 comes with the availability to use up to 84 wireless zones while the L5200 has 64 wireless zones. Also, accompanying the L7000 system is the availability to store up to 48 user codes and increase from the L5200’s 32 user codes. Though the L5200 is what will work perfectly for most people, The L7000 is a perfect system for those DIYers out there looking to maximize their alarm system experience, or for those who need the extra features the L7000 offers. Here at GEOARM we have all tools and resources for which ever system you decide to install. When installing these systems remember you can find our entire how to video collection on our website GEOARM.COM or by visiting our YOUTUBE page GEOARM.COM security. click this link for more information!!! Train everyone with access to your home on how to disarm the system, how to contact the monitoring company and which code words are needed to cancel an alarm by phone. Test your system at least monthly. Check backup batteries annually. Keep motion detectors clear of debris such as spider webs and bugs. Make sure air drafts don't move curtains, plants or decorations. Check that protected doors and windows close correctly. Alert GEOARM when you're out of town, change your contact information, have a remodeling project or a new pet (new systems factor in pets according to size). Keep equipment in good repair and consider upgrading. Recently developed technology helps reduce the chances of false alarms by making them easier to use. Examples: disarming a system via text message, monitoring it by video or interacting with it via wireless key fob. "vam" It’s an easy-to-install device that connects to the ECP bus of existing VISTA systems and allows you to add Z-Wave enabled lifestyle solutions like HVAC, light control, locks and powered shades. The best part is that it’s the lowest cost retrofit solution available and it fully integrates with the security system and video cameras. And, all of it can be controlled remotely using Honeywell Total Connect Remote Services. They may make a time-limited offer, and claim that you need to act now. For example, they may try to get you to sign a contract by telling you that the equipment is "free." More than likely, strings are attached. For example, to get your "free" alarm, you may have to sign a long-term and expensive system monitoring contract. They may pressure their way into your home and then refuse to leave. It is not impolite or rude to tell a salesperson you're not interested. It's much easier — and safer — to say "no" on the doorstep than to try to get the salesperson to leave once they're inside. If a salesperson continues to pressure you after you've asked them to leave, call the police. They may use scare tactics. For example, they may talk about a rash of supposed burglaries in your neighborhood. The sales agents may state or imply that they are from your existing security company and that they're there to "upgrade" or "replace" your current security system. Once inside your home, however, they may install a new security system and have you sign papers that include a costly contract for the monitoring service. They may claim your security company has gone out of business, that they've taken over the accounts, and that you have to buy new equipment and sign new contracts. If this happens, call your current monitoring company to confirm. Normally, you would be notified of a change like this by mail or telephone, not by an unannounced visit by a representative from another company. the FTC and your state Attorney General urge you to ask potential contractors for the following information. Use it to check out the alarm company with the appropriate authorities: your state Attorney General, local consumer protection agency, Better Business Bureau, and state licensing officials. If the salesperson is reluctant to give you this information, consider it a red flag and find another company to consider.